A lot of time & effort goes into our litters & all the puppies are raised & live indoors in a family enviroment,with both their two legged & four legged kin,we do our very level best to make sure that they have only the very best start in life & are well socialised & well adjusted little people & therefore it is extremely important to us that all our puppies find the very best of homes with the correct most suitable person/family for them.Whippets do not thrive living outdoors,so therefore we really prefer not to sell to homes where the puppy is to live permanently outdoors in a dog run. In order to find the best homes possible for each puppy we have in place a policy that will help us do just that, it consists of a few questions and if after reading through it you still genuinely wish to add a "Mossbawnhill" whippet puppy to your family then please contact us. Why have you chosen a whippet to become part of your family? Are you familiar with the breed's temperament and activity level? Do you already have a dog? Do ALL your family members want a new puppy? Do you have a well fenced whippet safe yard/garden? Is someone home during the day or able to get home to let the puppy out to the "toilet"? Will the puppy be left on its own for long periods of time? Do you have a particular interest in training the puppy for future use as agility or showing etc? Do you agree to return the dog to us in the event that you are no longer able to care for the dog,regardless of it's age? And on a final note.... we prefer to keep our puppies until they are 12 weeks old as this gives us time to assess the potential show prospects and choose our "keeper" & as all our puppies leave us fully innoculated & microchipped it also means that they could'nt leave here before then anyway as their last vaccination is not given until they are 12wks old. but we are more than willing to remove this in the future,once the puppy has proven him/herself in the ring (though this does not mean going out straight away and obtaining CC's & Grp wins!) & to be of a good enough example of the breed (no major faults,I am sure we can all live with minor ones and the perfect whippet has yet to be bred!) in both the new owners eyes and ours to be bred on from,and also that the new owner is prepared to keep in touch and inform us regarding future matings.We have remained in firm contact with all our previous puppy owners and in many cases have made a lot of new friends. 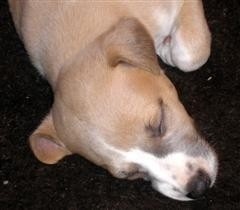 Thank-you for your interest in considering a Mossbawnhill puppy.